California + Travel + Romance: where exactly will you spend your next romantic California vacation? Our favorite California vacation spots may become yours too, including romantic spots on the Central & Northern Coast (Hwy 1 destinations like spectacular Carmel & Big Sur, Mendocino and Fort Bragg), desert resorts in Palm Springs, and of course, L.A and Frisco. Best Time to Getaway to California - anytime really! That may depend more on when you need to getaway from wherever you're at. Expense-wise, some of the best travel deals can be found anytime away from public holidays and spring break season. 1. San Francisco: no surprise here, but even in 2014, San Fran' just keeps on being amazing. Enough superlatives about romance and San Francisco have been written to fill volumes, but see it for yourselves and don't miss exploring the great neighborhoods of the City by the Bay, as well as a night or two in a small romantic inn. 2. 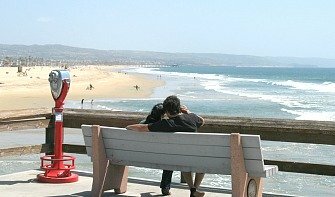 San Diego: lots of vacation, honeymoon or anniversary things to do here, like trolley rides to the Gaslamp Quarter, daytrips to Coronado Island, romantic dining in La Jolla and lots more, and all in the best climate in the USA. 3. Carmel: tucked away along the coast in Monterey County, this quiet little seaside town is a natural for picnics by the waves, a relaxing stroll among the galleries and cafes, or an attractive base for exploring more of the California's wonderful Big Sur. Northern California Romantic Getaways - leave the crowds behind and go "coastal", north on Hwy 1 to secluded Bodega Bay and Mendocino. Romantic Getaway in San Francisco - see our tips for a romantic cable car ride, great neighborhoods to wander together through, day trips, sunsets and more. 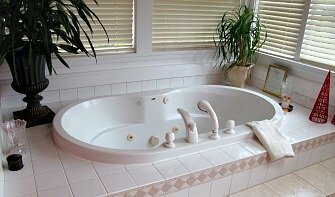 And for some romantic nights, check out our selection of great rates at San Francisco Hotels & Inns with Whirlpool Suites. San Luis Obispo, CA - one of the most laid back and delightfully romantic places on the Central California Coast. Full of fresh Pacific breeze and reliable California sunshine, there's a plenitude of beach walks, wine tasting and tours just minutes away. Paso Robles, CA - hot springs & wineries are good ingredients for a weekend filled with romance, and this smaller Central California community boasts both. Perfectly placed almost exactly 1/2 way between San Francisco and Los Angeles, this small city of 30,000 is a hub for food tours & fine dining, specialty shops, and some very nice landscapes dotted with vineyards waiting to be explored. Southern California Romantic Getaway - if you're not exactly sure about where to holiday or honeymoon in SoCal, this will give you an overview of some of romantic things to do, hotel packages and spots for couples in places like Santa Monica, Laguna Beach and Catalina Island. Romantic Getaways in Los Angeles - forget about the theme parks and discover LA's great beach communities! Explore sunny Santa Monica, stroll the waterways of the Venice Canals, and discover Naples Island by hydro bike or romantic gondola. Catalina Island Romantic Honeymoon Getaways - escape the mainland and head to the relaxing Channel Islands. Full info on planning a great honeymoon or anniversary trip to Catalina, including hotels and things to do. *New for 2018*: California's Best Beach Hotels & Inns - perhaps no other state has the variety of oceanfront hotels and inns you'll find in California. Check out this brand new guide we've created, full of our hand-picked top choices for romantic accommodation close to and right on the beach along the Northern, Central and Southern California Coast. 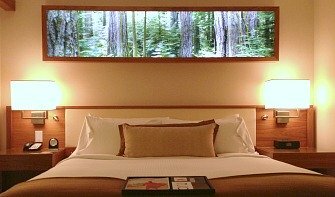 Top 10 Romantic Hotels in San Francisco - in a city full of great places for couples to stay, we try to narrow it down and give you a good idea on where you'll find romantic accommodation within your budget. 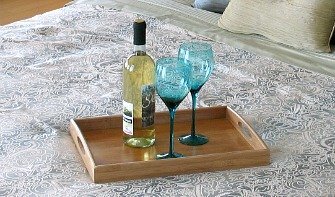 Northern California Bed & Breakfasts - honeymoon accommodation in Mendocino, Healdsburg, Fort Bragg & more. 1. La Jolla Cove - outstandingly beautiful and serene enclave of beach and cliffs in this swanky North San Diego neighborhood. You may see seals and sea lions, some wedding photos being taken, and certainly fantastic sunsets on clear evenings. 2. Carmel - pick up a quick lunch in downtown Carmel and head west for a great time on the white sand. Occasionally the fresh ocean breeze brings along some fog, but it adds to the romance! 3. Coronado Beach - "gorgeous" is the word that comes to most visitor's minds when they set foot on this beautiful soft sand beach. Great location too in San Diego, close to good dining and accommodation. 4. Laguna Beach - couples holidaying here love the clean sand and water, and nearby Heisler Park and Crystal Cove State Park are very scenic stops on your way to the water. 5. Baker Beach, San Francisco - any strip of sand with the Golden Gate Bridge in the background must rate high on the romance scale! Parking can be a bit of a challenge, but it's well worth the effort. Great spot for watching people and the ocean. Elope in California - elopement ideas and destinations in Northern, Central and Southern California, including romantic Wine Country inns with wedding packages. Up to 50% Off Romantic California Hotels & Inns - save big on great places for couples getaways, like San Diego's La Jolla Cove Suites, The Grand Del Mar, and The Biltmore Hotel in Santa Barbara, CA. VisitCalifornia.com - official site for State of California Tourism.